Alan Shepard was the first American in space in 1961. In 1963, John Glenn was the first American to orbit the earth. Neil Armstrong and Buzz Aldrin, in Apollo XI, were the first men to walk on the moon in 1969. This new frontier began to have an influence on fashion in the 1960's. Space-age silver which was mixed with primary colored prints taken from Pop and Op Art. Novel fashion materials were introduced, including shiny, wet-look PVC, easy-care acrylics and polyesters. In 1964 Andre Courreges launched the ‘space-age’ look. His success was followed by Paco Rabanne’s 1966 interpretation of the futuristic theme. Rabanne created clothing using plastic, metal and even chain mail. This extreme look caught on commercially in the form of chain link belts, heavy metal necklaces and disk like earrings. 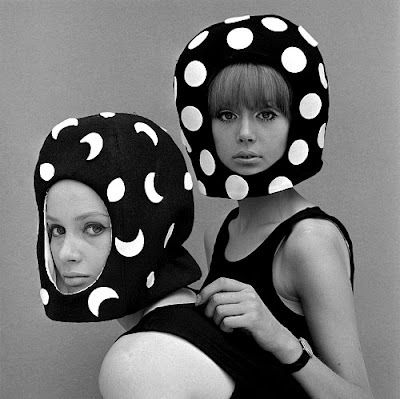 Pierre Cardin also created his version of the space age look with stylised visored helmet hats and shift dresses. Sit back and enjoy this short video featuring space age influences in fashions of the 1960's.